A paper published today suggests chronic exposure to an environmental toxin may increase the risk of neurodegenerative illness. For the first time, researchers have shown that feeding vervet monkeys a toxin produced by blue-green algae resulted in protein deposits in the brain, consistent with those seen in human Alzheimer’s. Neurodegenerative disease is an umbrella term which includes Alzheimer’s, Parkinson’s and motor neurone disease (MND). The causes remain largely unknown, and the role of environmental factors is poorly understood. Owing to its role in an unusual illness suffered by Chamorro villagers on the Pacific island of Guam, researchers have been investigating an algal toxin called BMAA for more than 40 years. The Chamorros’ diet was contaminated with BMAA and they suffered from dementia as well as a combination of symptoms typical of Alzheimer’s, Parkinson’s and MND. In the study published today in the Royal Society Proceedings B, researchers fed vervets fruit: some with BMAA, some with a placebo and some with a known inhibitor of BMAA, an amino acid called L-serine. After 140 days, they detected protein tangles and plaques, a hallmark of neurodegenerative disease, in the brain tissue of all the animals fed BMAA, but not in the placebo animals. While the role of tangles and plaques in neurodegeneration has not been conclusively established, they are the prime suspects for causing the death of brain cells. This is the first time researchers have been able to produce Alzheimer’s-like protein deposits in an animal model with an environmental toxin. Even more fascinating was that the vervets fed BMAA plus L-serine showed a significant reduction in the number and density of protein tangles in the brain. This suggests that L-serine may be useful as a preventive therapy in people at risk of neurodegenerative illness. L-serine was first reported to block BMAA toxicity in cell culture in 2013, but this is the first evidence it can prevent the formation of protein deposits in the brain. What makes these findings so compelling is that while we’ve known for decades that BMAA was toxic, this is the first time it has been shown to directly cause disease. BMAA was first suspected as a neurotoxin when it was linked to the Alzheimer’s-like illness in Guam, which at its peak killed 25% of the men of one village. When the search for a genetic link turned up nothing, environmental triggers became the focus. BMAA was isolated from flour made from cycad seeds, which the villagers used to make tortillas. The very first experiment done in the 1980s found that BMAA was able to cause symptoms consistent with neurodegeneration, but was quickly discounted when it was argued that an equivalent human dose would require the consumption of more than 1,000 kilograms of cycad seed flour. And so BMAA was off the hook, at least for a few years. A key missing puzzle piece was how BMAA might stick to proteins as was seen in the cycad flour. Its chemical structure meant it was water-soluble, so how was it building up in the flour? It wasn’t until more than 40 years later that a plausible explanation was proposed. A 2013 paper I worked on reported that BMAA was similar in structure to another amino acid that humans use when they make proteins. So similar in fact, that we showed it could be mistakenly inserted into the protein chain when they were synthesised, rendering them toxic and subsequently killing cells. Not only do the findings of today’s study provide evidence for what we’ve long suspected, they implicate a widely distributed toxin in a growing and formidable human health problem: dementia. BMAA is made by blue-green algae (more accurately known as cyanobacteria). The algae have evolved over 3.5 billion years to grow in fresh and salt water, in the desert crusts of Qatar, and in the thermal pools of Yellowstone National Park, in Wyoming. Blooms commonly occur where nutrients are high, such as in areas where agricultural run-off occurs, and can be identified by their bright green colour and putrid smell. The problem is these blooms are increasing in size and frequency as global temperatures rise. And Australia is not immune, having had the world’s largest freshwater algal bloom in the summer of 1991–92 in the Barwon-Darling river system. Even more concerning, and similar to what was observed on Guam, there is evidence that BMAA can be absorbed into the proteins of grain crops if they’re irrigated with contaminated water. We also know that BMAA concentrates in seafood, such as mussels, pink shrimp, prawns and lobsters, when they grow in waters where blooms flourish. 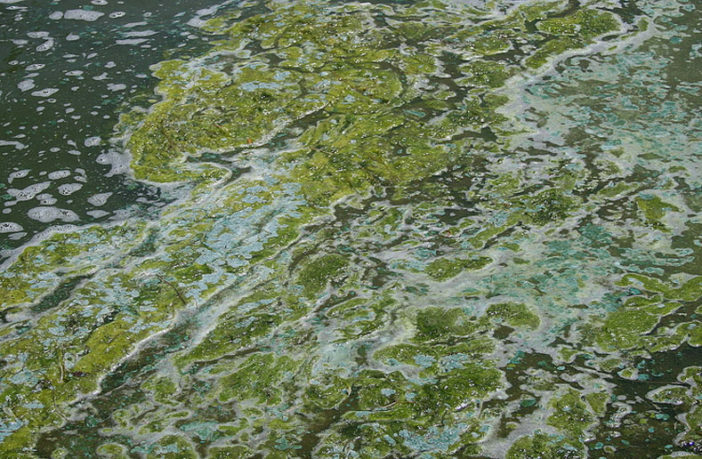 Studies show that people who live by lakes subject to frequent algal blooms have an increased risk of contracting MND. The risk is even higher if you live downwind, suggesting a role for inhalation as a route for toxicity. While the risk for exposure via these routes for those of us who have a balanced diet and live in the city is probably low, we simply don’t know how much BMAA is present in the environment because food and water is not routinely screened. Methods are available, but they’re expensive and require a high level of skill to conduct accurately. This makes them impractical to implement on a commercial level. Also, blue-green algae does not always make BMAA – ideal conditions include precise concentrations of nutrients and warm temperatures. So if BMAA is already distributed throughout the environment, meaning we’ve all been potentially exposed to some degree, why don’t we all have some form of dementia? Recent scientific modelling suggests that multiple “triggers” are required for disease to occur. Iin the case of neurodegeneration it’s likely you need a combination of genetic susceptibility, exposure to any number of environmental toxins (including BMAA) and other triggers as yet unknown. In the meantime, the best advice is to take precautions – reduce your risk of exposure to BMAA by staying away from green, smelly blooms, don’t drink the water and take heed of warning signs. Because even though we now know BMAA can cause disease, we don’t yet have a cure, so there’s much more work to do.